At the age of just 18 years, the hard-working young man made his way to the United States in 1870 aboard the SS Marathon. After his arrival in New York, he set off for California to make his fortune. Devoting his energy and attention to every detail, Clark soon mastered the mining business. 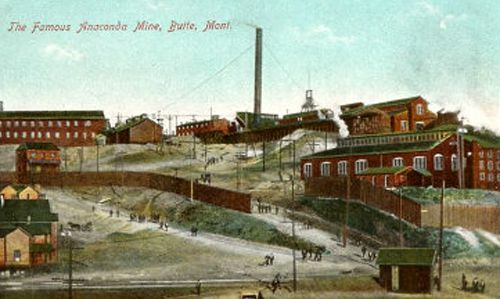 In 1876 he made his way to Butte, Montana, where he became closely associated with Marcus Daly, who he worked for as the foreman of the Alice Mine. In 1877, Clark participated in the Battle of Big Hole of the Nez Perce War, under Senator William A. Clark, as major in command, with General John Gibbon as commander-in-chief. By the end of the 1870s, he was working as a superintendent of mines at the Comstock mines in Virginia City, Nevada. While in Butte, he met his wife Mary Stack, whom he married on St. Patrick’s Day, 1881. The couple would eventually have six children. That same year, he opened the Anaconda Mine for Daly, where he also worked as foreman. He continued to be associated with Daly for the next several years. Afterwards, he worked with ex-Senator William Clark of Montana in his mining enterprises. Watchful of opportunity, he went to Spokane, Washington in 1887 and opened up the Poor Man Mine in the Coeur d’Alene District. He was part owner of this mine and acted as general manager. Later he operated at Rossland, British Columbia, Canada where he opened the War Eagle Mine in association with two men by the names of Finch and Campbell. The Republic Mine in Ferry County, Washington was also opened by Clark in 1896. 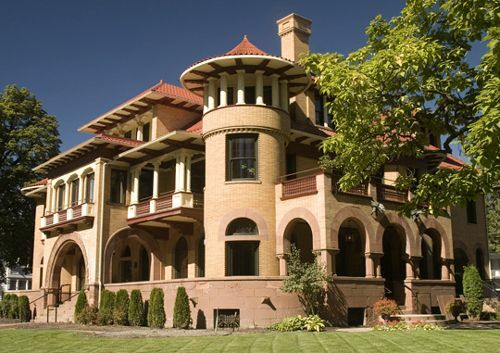 In 1889, his mansion as well as several others burned in the Great Fire of Spokane. But, having already made a fortune by this time, he hired architect Kirkland Cutter to design an even better one. He sent Cutter abroad to gather inspiration and furnishings, and when the massive 12,000 foot home was completed in 1898, it was the talk of the town, if not the entire west coast. The 3 ½ story extravaganza, suggesting Spanish and Moorish influences, included rounded corner towers and arched loggias. The exterior sandstone was imported from Italy and the brick was made in St. Louis, Missouri. The interior included custom made Tiffany lamps and chandeliers made in New York, onyx fireplaces, 14-foot stained glass windows, golden lined chairs, silk curtains and a grandfather clock that was said to have cost $17,000. Behind the mansion was the combination of carriage house and stable. Sparing no expense, the mansion and its furnishing cost $13,000,000. Though the Clarks entertained lavishly and loved their new home, Patsy continued with his mining ventures. In 1903, he brought his mining expertise to Southern Oregon, agreeing to take over operation of 14 consolidated claims along the Blue Ledge lode that spanned the California–Oregon border south of the Applegate Valley. Later, in 1906, he founded the Furnace Creek Copper Company and established the settlement of Furnace in Death Valley, California. In addition to the many mines in the American West, he was also and an extensive investor in Canada and Mexico. Coming to America with little or no money, he became a wealthy man by working hard and learning everything he could about the mining industry. Patsy and his wife continued to live in their extravagant mansion until their deaths. Patrick died in 1915 and Mary passed on in 1926. Their mansion was then sold to an investor by the name of Eugene Enloe. Passing through a series of hands over the years, the mansion began to deteriorate and by the 1970’s, it barely escaped demolition. Though the owners at the time knew they could sell its furnishings for more than they had paid for the property, they worked with the city for a zoning exemption to allow converting the beautiful old mansion to a restaurant. The city agreed and the mansion was soon opened as the Francis Lester Inn, a restaurant and reception/event establishment, which operated until 1982. It then sold again, was restored and re-opened as a high class restaurant known as Patsy Clark’s Restaurant. After operating for 20 years, it also closed and the building was sold again. It was then purchased by the law firm of Eyman, Allison, Hunter, and Jones, who have restored the building to its former glory. Today, the mansion’s second and third floors now house the law firm’s offices, while its main level is available for private catered events including receptions, small luncheons, dinner parties, and weddings. Placed on the National Historic Register in 1975, the mansion is located at 2208 W. Second Avenue in Browne’s Addition Historic District in Spokane, Washington. Though certainly not one of the most haunted places in Washington, and not known for being the site of any tragedies, the Patrick Clark Mansion is nonetheless, said to be haunted. Nothing is known about what or who is said to allegedly haunt this beautiful building; but, this writer would not at all be surprised if it’s not Patsy Clark himself and/or his family; who may have very well have been disturbed by the fact that the elegant home was once slated for demolition. The rumors of hauntings began at about the time the mansion became a restaurant and the stories tell of three entities that are said to lurk within the old wine cellar in the basement. Said to be playful spirits, they have had a reputation of making restaurant employees the brunt of their antics. Tales reported they have enjoyed playing practical jokes on employees, such as tossing wine bottles and other articles across the room. Former employees also reported hearing voices of unseen people as well as feelings of not being alone when they were sent to the basement for wine. Others reported cold spots and drafts. In fact, for a time, the antics were so common that many employees dreaded going to the basement. It is unknown whether these playful spirits continue to lurk within the cellar today. Renovations and restorations of old mansions have been known to activate entities, as well as eliminating them. © Kathy Weiser/Legends of America, updated December, 2010.